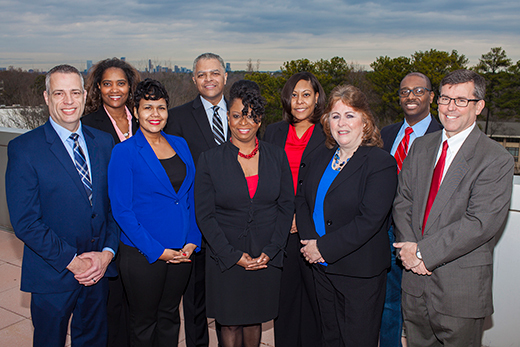 Emory's Learning & Organizational Development (OD) team includes (front row, left to right) Jonathan Koestler, senior OD consultant; Melody Johnson, senior training consultant; La Sheree Mayfield, training coordinator; Wanda Hayes, senior director, Learning & Organizational Development; Randy Lucius, director, Organizational Development; (back row, left to right) Anisthasia Carter, associate director, Learning & Development; Del King, interim vice president for human resources; Shaundrea Rhodes, senior training consultant; and William O'Neal, senior training consultant. The Learning and Organizational Development Department offers a variety of learning opportunities, including open enrollment courses, customized workshops, performance consultation and facilitation services. Excellence Through Leadership: Provides development for Emory’s senior leaders through all segments of the university (excludes Emory Healthcare). Emerging Leaders at Emory: Provides development for Emory’s mid-level leaders to help prepare for more strategic roles within the university (excludes Emory Healthcare). Essentials of Leadership at Emory: Offered twice a year, the program aspires to develop leaders capable of shaping the future of the organization. Aspiring Leaders at Emory: Prepares individuals to become people leaders while advancing the mission of the university. Administrative Professional Program: Develops administrative professionals who demonstrate competency in a wide range of responsibilities, including managing projects and coordinating daily operations within their departments. HR Rep Certification Program: Aimed at current and aspiring human resources representatives who seek to develop core competencies in HR administration. This year, Emory’s Human Resources division has received three national awards in recognition of the university’s achievements in learning and organizational development programs and human resources excellence. The awards come from professional human resources organizations, associations and publications and offer validation for the university's efforts to provide employees with leadership and professional development opportunities, says Wanda Hayes, senior director for learning and organizational development. “Feedback from people who go through our programs consistently tells us that it’s making a tremendous difference in professional and personal lives — that’s rewarding,” she says. Although a focus on learning and organizational development has long been in place in corporate America, that’s not always been the case for higher education, according to Hayes. But Emory is different, she adds. For more than 35 years, the Leadership Excellence and Development (LEAD) Forum has identified the nation’s top leadership programs within organizations, offering recognition for their strategies and solutions. During a Feb. 8 awards gala, HR.com and LEAD recognized Emory’s Learning and Organizational Development program among this year’s top leadership programs. “The award recognizes innovation and creativity within the organization and in the design and execution of a leadership program in the last 18 months,” according to Hayes. Specifically, the award recognized the university’s “Emerging Leaders at Emory” program, which provides education and development for Emory’s mid-level leaders to help them prepare for more strategic roles within the university. The program will launch its third cohort in Fall 2017. Out of some 350 applicants in the “Innovation and Deployment of Leadership Programs” award division, which included top corporations across a wide range of fields, the top 10 percent were selected and ranked. Out of the 35 winners, Emory ranked 9th overall, Hayes says. All award winners and rankings are now featured in the February 2017 edition of Leadership Excellence Essentials. This regional award honors transformative HR work in higher education, including teams and individuals who have provided HR leadership resulting in significant and ongoing organizational change within their institutions. Presented on Feb. 26, the recognition automatically qualifies Emory’s Learning and Organizational Development department to be represented for a national award, which will be selected from among the nation’s four regional winners at a national conference in September, Hayes says. Emory has won recognition through this award for the past seven years and represents the only academic institution to win the LearningElite Award to date, according to Hayes. Each year, Chief Learning Officer magazine’s LearningElite program honors the best organizations for learning and development. This peer-developed benchmarking program recognizes organizations that employ exemplary workforce development strategies to deliver significant business results that benefit their organization, industry and the learning and development field, Hayes says. Learn more about leadership programs and resources available to employees through Emory’s Learning and Organizational Development department.